Let's talk about conservative treatment and its importance in treating capsulitis. In our practice we exhaust all conservative measures before proceeding with surgery, specifically with elective cases. This is for the simple reason that the practice of medicine is always a balance between risks and benefits. There are times when conservative measures do not make sense for example a dislocated/fractured ankle needs to be fixed surgically. However, for the most part, the majority of issues that patient's present with can be managed and corrected without surgery. All joints have a capsule, made up of ligaments that hold the joint together and contain joint fluid. 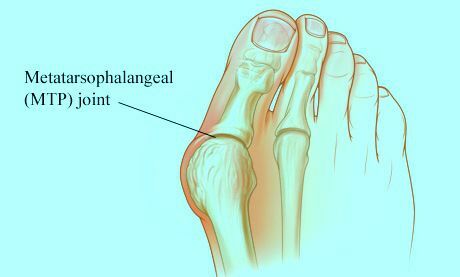 The joints behind the toes (metatarsal phalangeal joints (MPJ)) can be susceptible to an inflammation of the joint due to underlying biomechanical issues. Usually this is due to an elongated metatarsal and/or associated hammer digit deformity. Early treatments of capsulitis involving rest, ice, and strapping/taping are very important to allow the capsule to scar in and maintain stability to the joint. When these instructions are not followed, the joint capsule can tear and the toe will drift in position. This can cause an overlapping deformity of digits. Once this occurs, surgery is the only way to relocate the toe and resolve pain the joint. If you have pain in the ball of your foot and specifically if you are developing a cross-over toe deformity come see one of our physicians at Indiana Podiatry Group, we can help!